Protests Against Israel’s Genocide | Israel Genocide? By advancing its discriminatory work within the JNF and GZA, Israel aims to divert attention away from their acts of genocide and war crimes in the occupied Palestinian territories under the guise of environmentalism and sustainability. Greenwashing is when ethnic cleansing is masqueraded as environmental action, and Israel has attempted to rebrand their war crimes through promoting their so-called “green” organizations at conferences around the world. The absence of Palestine past, present, and future in Alon Tal’s extensive work reveals clearly that his vision and Israel’s green policies are nothing but, what Jasbir Puar called, “Israel’s project of rehabilitation through the spatial, affective, and corporeal debilitation of Palestine.” It is imperative to understand that social justice remains a core of environmental justice, and that the framing of environmental issues can never be separated from indigenous struggles for land, resources, and decolonization. As party to the Statute of the Court, the State of Palestine and its territory falls under the jurisdiction of the ICC, allowing it to preside over any felony that amounts to genocide, crimes against humanity, war crimes or the crime of aggression committed within its territory. 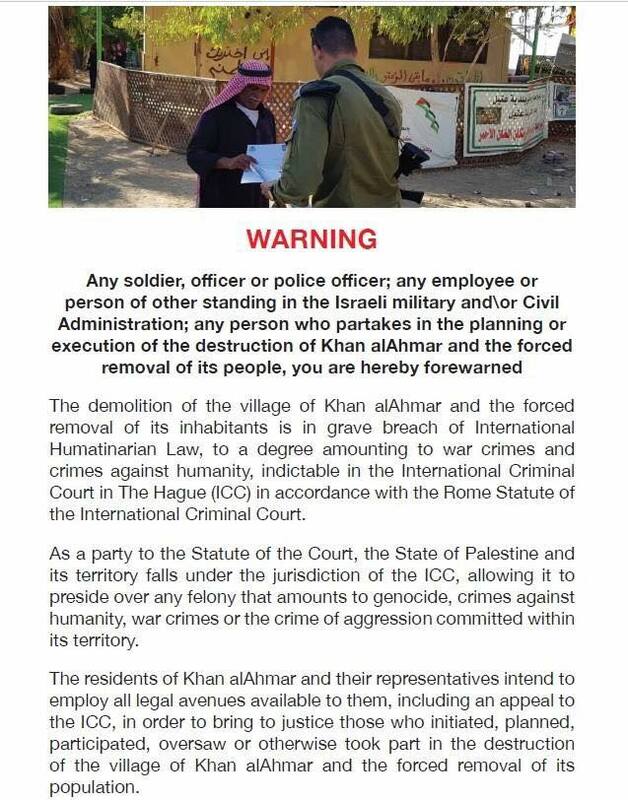 The residents of Khan al-Ahmar and their representatives intend to employ all legal avenues available to them.